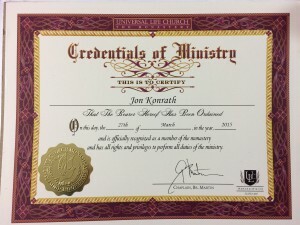 In addition to being a world-famous fiction writer, cough syrup enthusiast, and inventor of the zero-g bong, did you know I, Jon Konrath, am an ordained minister? I can also perform funerals, although note that if you ask me to do the eulogy, there’s a strong possibility I will talk about RoboCop for an hour. Anyone else here trying out Google’s new Photos thing? They announced this new service the other day, a “gmail for photos.” Traditionally, Picasa had a quota, like any other cloud photo storage service, and then you paid for more space. Now, they offer an unlimited amount of storage for free. Also, unlike G+, this isn’t a place for you to simply share photos and make them public; by default, photos (and videos) are made private, and then you choose to share them if you want. This also isn’t a “social” play like G+, or sharing on Facebook or elsewhere. You can share photos from there, but it’s more like a storage bucket where you put things, and then optionally share them if you want. The interesting part to me is that Google is adding various features to automatically categorize or clump together photos. The obvious one is that it will create virtual collections of places, like when you dump all of your geo-tagged photos into one clump. But the other neat thing is that it guesses at other categorization. 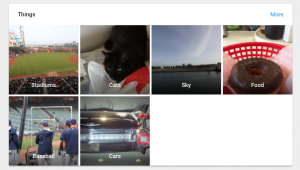 For example, I had categories magically show up for food, cats, baseball, stadiums, and sky. Your photos are still maintained in a chronological order, just a “firehose” dumping ground, like throwing everything into a folder, but it does this smart collection thing on its own. You can also sort and create collections, and share those, but I’m mostly interested in what it can do without my interaction. It’s not entirely clear if the original resolution photo is being kept, or if it is hosted. There’s some vague language saying that under 16MP files are kept in the original form. I think it’s serving up compressed versions of them, but you can get at the original (under-16MP) ones if you need them. Vs. iCloud: I am not paying Apple to store a copy of my photo library and then killing my battery to constantly sync with it, sorry. It’s why I ditched Aperture. Vs. Dropbox: Dropbox has a quota, and its sharing stuff is a bit clunky. Vs. Amazon Prime photos: Amazon has an unlimited quota, and keeps originals, but their sorting/sharing/organizing is barely there. Vs. Flickr: I don’t like to dump everything to Flickr, because I use it as a destination for albums of sorted, edited, and cropped photos, not everything I take. Plus it’s my “public” destination, so I’m not sending private photos there. Vs. Instagram: I only see that as a one-shot thing for sharing a single, square-cropped photo, not entire albums. Vs. hosting it myself on this site: ugh. I haven’t messed with the mobile app yet, but this seems like it could be a good solution for the person who only takes pictures on their phone or tablet, and don’t want to sync with a PC at all. They have a Mac (and I assume Windows) uploader program that you can set loose on one or more directories, an iPhoto library, or any inserted cards/phones to upload the images. My current game plan is to keep my workflow as before: import my cards/cameras to a Lightroom master catalog, and import from my iPhone and iPad when physically plugged in. Then I’ll create collections, edit, and share to Flickr. But I’ll also upload to Google Photos in the background from my laptop, mirroring my LightRoom masters directory. When I need to one-off mail a picture, I can do that. I also mostly want a way to look at my entire collection when I’m not at my computer, without keeping 30,000 photos on my phone. One thing suspiciously missing (and this may be on purpose) is that there’s no way to embed a photo from Google Photos into a page here or elsewhere. That would be awesome, to drop a google link in an image tag on this blog, and have Google host it up instead of me. But I could see why they would leave that out on purpose. A side note, and a concern, is that there’s got to be some end game to this for Google. Like maybe they’re using this data and tracking where you go, or training some evil facial recognition software, so this isn’t a service for the tinfoil hats. I’m more worried that this will be an Embrace, Extend, Extinguish play: knock all the other services out of the water with a free offering, and then start charging for it later, or remove features, or just pull a Google Reader and shut the thing off with no notice after all of the competitors are dead. I wouldn’t trust this as a primary form of storage, but for a side mirror of my data, why not. Anyway, photos.google.com. Try it out, let me know if it works for you. I got tickets to see San Diego play San Francisco last week, via my wife’s work. It was a last-second, unplanned thing, but my first game of the year, so I went to eat, take a few pictures, and eat. I took BART from West Oakland to SF, which itself was pretty fast, but I always underestimate the walk from the subway to the stadium, which took about 30 minutes. I brought my full-sized DSLR, with the usual kit lens and zoom, plus a new 10-18mm wide. I also brought my EOS-M mirrorless with a 50mm prime. I shot a touch of video with the EOS-M. The wide-angle lens didn’t work out. 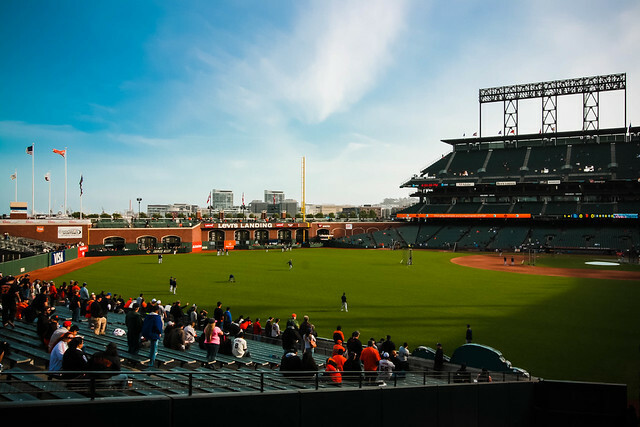 I feel like I keep taking the same pictures of AT&T park over and over again with the zoom. The 50mm and the mirrorless was great. We had a box suite, but went downstairs to the club level to eat. I ended up getting a trio of sliders that were corned beef and briscuit, and a bratwurst. The corned beef was exceptionally good. The bratwurst was a bratwurst. I’m still (allegedly) a Rockies fan, so I don’t like the Giants or the Padres. I won’t say anything bad, except that I think it’s chickenshit when a World Series champion’s fans boo every player’s at-bat, especially when you’re outspending all but three teams in the game. I actually like the Padres’ dark uniforms. I think they remind me of the Brewers’ uniforms, minus the cool caps. The game itself was eh. The Giants jumped ahead fast, and the Padres never scored. It was Cinco De Mayo, and some dude proposed on the kiss-cam. I saw a huge dude with a giant Bud Lite logo tattooed on his hand. The Rockies game that I was going to passively follow was rained out. We left after the 7th inning. A bit boring, but I do like going to AT&T for the food.